Does Your Umbrella Withstand 82 MPH Winds? Watch as a man subjects himself and his umbrella to 82 MPH (133 KPH), hurricane-strength winds. 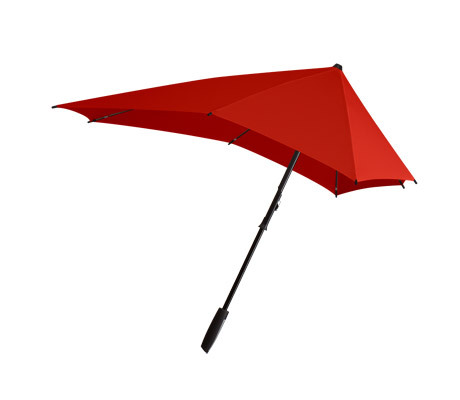 The umbrella, made by Dutch company senz°, achieves this strength by working with, not against, the wind. Their asymmetrical design has a minimal point of front contact, avoiding the common sail effect of round umbrellas. The umbrella spokes also pivot in such a way that should the umbrella get turned out, it yields to, rather than resists, the wind. Check out the senz° Youtube page to see more heroic feats of umbrella-strength, such as a parachute drop with the umbrella. We found a variety of senz° umbrellas on Amazon starting around $40. Many of the US models are made by Totes, who is licenses the senz° design. Senz° is a great example of rethinking common objects to make them more practical, durable and smarter. Who says umbrellas should merely last for a handful of storms? What if you could have one umbrella for life? Do you know of other common products that achieve superior utility and durability by bucking traditional design? Let us know what they are in our comments section.